I have to be honest, I almost bailed on this book. The first half there wasn't much dialogue and that is a huge pet peeve of mine. I need dialogue. Plus, the first half just seemed to be the same thing said over and over. After saying that, I am so glad I stuck with it because I ended up really liking the story and all of the characters. Gus and Rey are two characters you can't help but love after finding out their back story and following their story. I also love all of Gus's brothers and can't wait for their stories. For me, this was a lot tougher to get into than Rhys Ford books normally are. I'm not sure why other than maybe because we were jumping in where there was a whole lot of backstory that we needed to get caught up with in order to feel the emotions the characters were feeling from the get go. I will say, the further into the book you get, the more you learn and the more you will love the characters. My heart hurt so many times through this book as secrets are reveals or I suppose, more of the story is revealed. I have to say that I'm glad I stuck through the beginning so that I could get to know the guys and really cheer for them to find a happy ending. This is the best kind of angst fuelled romance. As children attempting to survive chaotic and abusive situations, a small group of men claimed each other as brothers and their bond pulled them through the horrors of their early years. The first story is Gus’. When he finds out he has a child, he finds himself struggling to adult and overwhelmed by memories of his own childhood traumas. Gus and firefighter Rey have a long and tangled history as lovers. But Rey needs security and Gus has never been able to settle down or grow up. This is a difficult and quite graphic read. Gus’ experiences as a child are horrific. I like that the writer doesn’t allow any quick fixes or easy solutions to Gus’ trauma. The relationship between Rey and Gus isn’t an easy fix either. The angst in this story feels real. The emotions are raw and honest. Love doesn’t fix Gus. Being a father doesn’t either. But both are catalysts for Gus to reevaluate and attempt to create a future that is different from his past. I found parts of this story hard to read. I blubbed through way too much of this book but I loved Gus and Rey fiercely and I couldn’t put their story down. I love these brothers and I’m really excited for future books in the series. But I have to admit that I found the writing style of this story really difficult to get into. This is the first book in the series, but readers are plunged into complicated relationships between characters with more than twenty years of history between them. The story starts with a series of flashbacks and snippets that don’t easily fit together. It took me some time before I understood who the five ‘brothers’ were to each other and figured out how the other men fit into their lives. This series could benefit from a list of characters or a family tree of sorts at the start of each book. 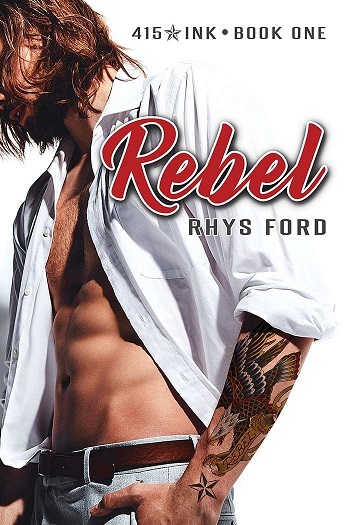 Reviewers on the Wicked Reads Review Team were provided a free copy of Rebel (415 Ink #1) by Rhys Ford to read and review.